Today was a therapy dog library day for Chou Chou, and 3 other dogs and handlers. 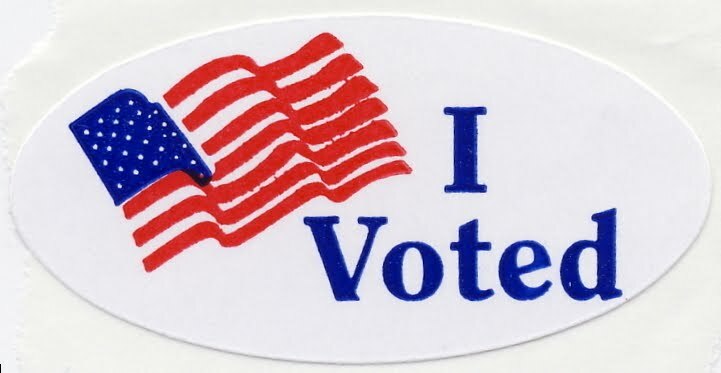 It was also election day, and the library was a crowded polling place. Lots going on! First obstacle was the parking. With all the people coming to vote -- it's a politically aware neighborhood, and they vote even for midterm elections -- we drove around for a while until we found a parking spot. I saw a man in a suit and tie standing in front of the library, greeting people. I recognized him: the mayor of Sacramento. As soon as I crossed the street with Chou Chou, she pulled me over to him. Whoosh! She didn't jump on him ("Of course not! I didn't want to get his suit dirty! "); she stopped in front of him and sat, but he was startled. I apologized. "I'm so sorry! We're on our way inside to be part of the Read To A Dog program today. I'm really sorry!" ("Dogs really hate when our pawrents apologize for our behavior! He was smiling and looked friendly! I was being friendly! What's the problem?") He laughed. We went into the library lobby. Our program was upstairs but I was waiting for the other teams. Meanwhile, people were coming out of the voting room. Many people saw Chou Chou, smiled, and asked if she voted yet. I had voted earlier in the day; I took my own "I Voted" sticker and stuck it on her hairclip. The other dogs arrived and we went upstairs and waited for children to come with their books. Chou Chou pulled to greet the Cavalier King Charles Spaniel. ("A new little playmate for me!"). When the kids came in, she settled down on the mat and they read to her. A few of the children saw the sticker I put in her hair and asked, "Can dogs vote?" At the end of the hour, we left the building. The mayor was still there, so I took a different route back to the car. He's probably had enough of Chou Chou today. I felt lucky for one thing: there were no TV cameras there when she met the mayor!